Booking your wedding can take up all your time but you need to also think about planning your honeymoon. With more and more of the world being accessible to us, the world is literally your oyster. Use an Independent Travel Adviser for a personalised service and the latest deals. We asked Martini Travels to give us some top tips on planning your honeymoon. As an Independent Travel Agent you get that personal touch, we are always on hand to help with any holiday needs right up until your holiday and even whilst you are away. Here are some of the things to bear in mind whilst you are planning your honeymoon to make sure you book exactly what you want. It’s suggested that you book your honeymoon at least 8 months before you want to travel. If you are going to an exclusive resort then these tend to book up fast. This time also allows you to plan all aspects of your honeymoon. Remember that this is your honeymoon, a celebration of your love, so don’t copy others. What one couple do isn’t always suitable for every couple. So make sure you are going where you want, not just the latest instagram worthy location! Have a plan in mind for when you are there, you don’t have to go crazy with it and book up every second. It is advisable to chat about what you both want out of this trip, is it totally relaxation or a big adventure? Then you can book any excursions or day trips accordingly. This can be tricky when you are in the midst of planning and paying for a wedding. But you need to also set aside some money for your honeymoon. Saving a little each month will make it easier to find that all important spending money. Think about asking for money on your gift list to go towards your honeymoon if funds are a bit stretched. There is always an option of having a destination wedding and honeymoon all in one. This allows you to make the most out of your time and include family and friends. You could always move onto a different location after the wedding for your honeymoon or keep the party going with all those you love. Some of our real brides chose destination weddings because a tea length wedding dress style works so well. 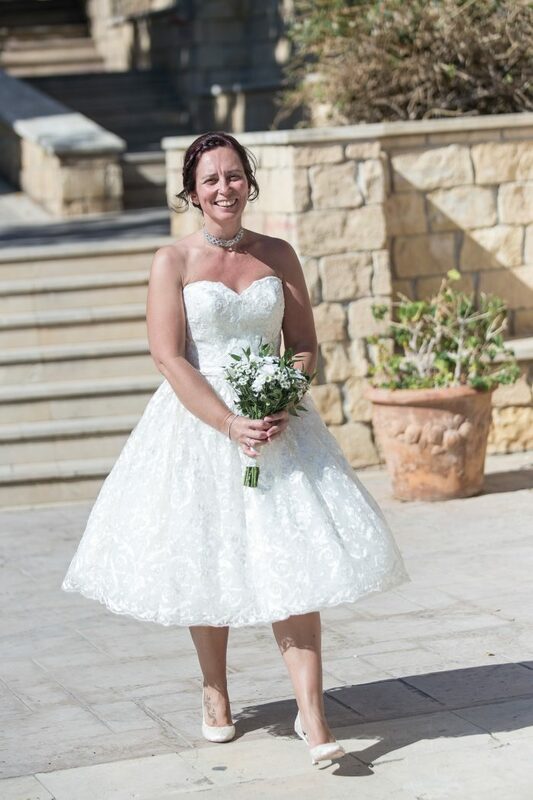 Trisca got married in Paphos, Cypress and enjoyed a sunshine wedding day in her tea length wedding dress. Trisca chose to wear Emily by Rita Mae. A stunning Gold Embroidered Lace 1950s vintage inspired tea length wedding gown. The strapless dress is light and ideal for a destination wedding venue. If you are looking for your ideal short wedding dress then book your one to one appointment today. 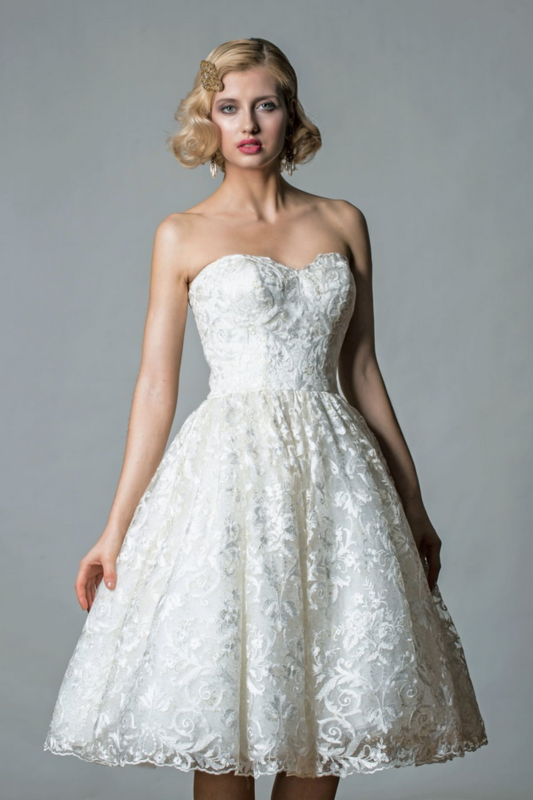 We have over 100 designer tea length wedding gowns for you to choose from.